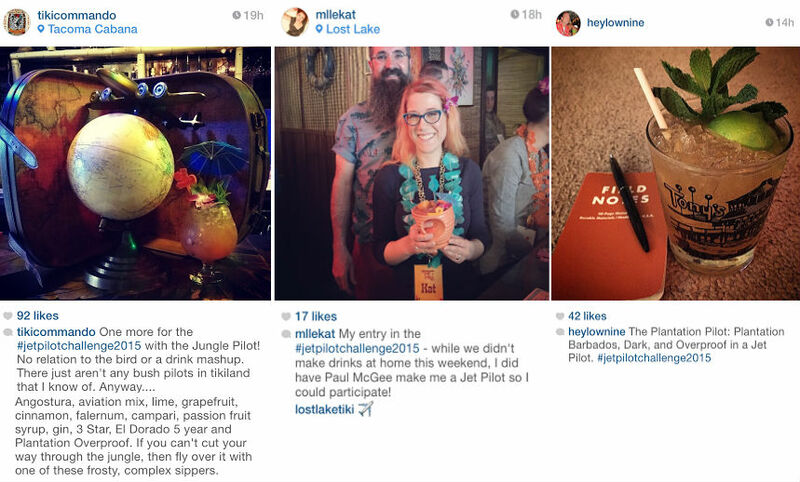 Last weekend was the Fogcutter Challenge…..and this weekend we continued the boozy activity with the Jet Pilot Challenge! 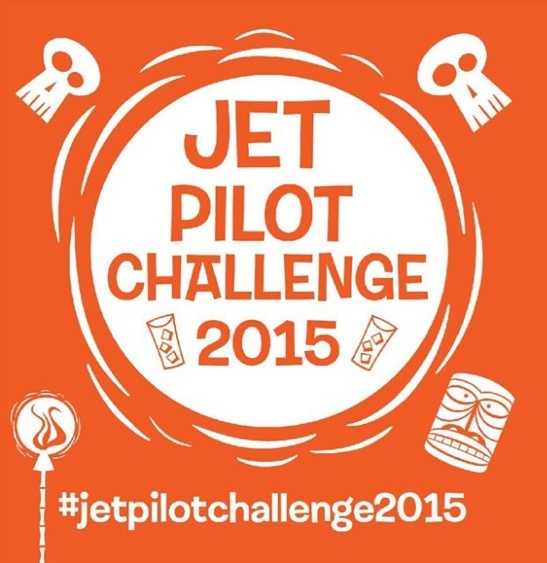 you were supposed to make a Jet Pilot or a variation of it and post up the picture on Instagram with the hashtag #jetpilotchallenge2015 and best picture wins a prize! you don`t even must make a drink yourself you can take a picture of a Jet Pilot in a bar too. 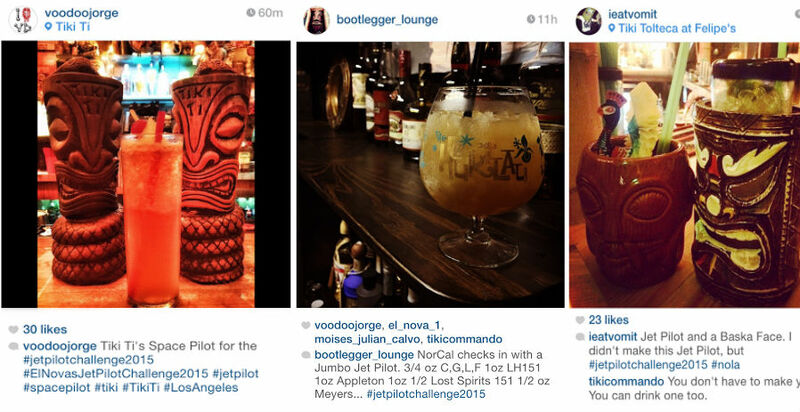 Follow @el_nova_1 on Instagram for updates and check the #jetpilotchallenge2015 for more boozylicious pics! there will most likely be more Jet Pilots posted there as I write and post this as well as the next challenge coming up being announced. 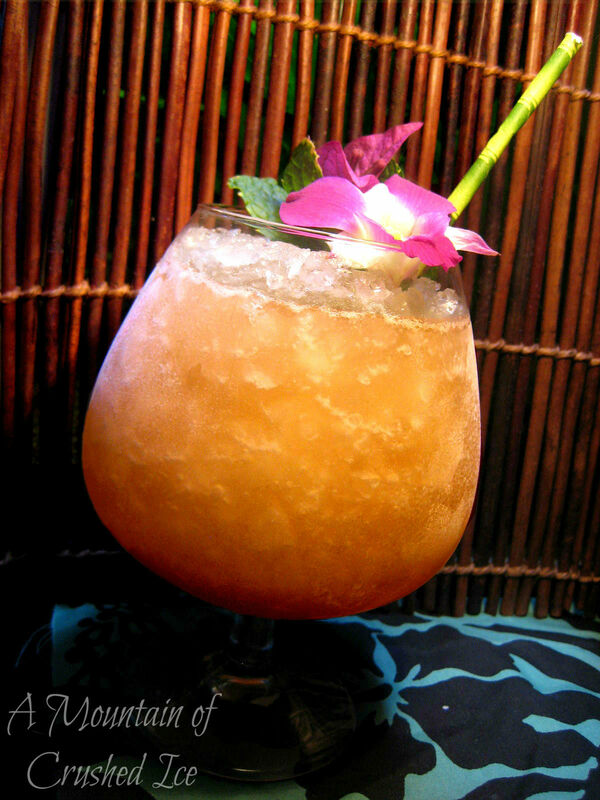 The Jet Pilot was one of the most copied drinks during the hey days of the tiki era, and the drink had many names – the drink was known as the Ace Pilot, Space Pilot and Astronaut…and at the Mai-Kai, it became the Jet Pilot created by Mai-Kai’s original mixologist, Mariano Licudine who before coming to Mai Kai to design their original tropical drink menu, worked for Donn Beach who btw was a decorated World War II veteran. 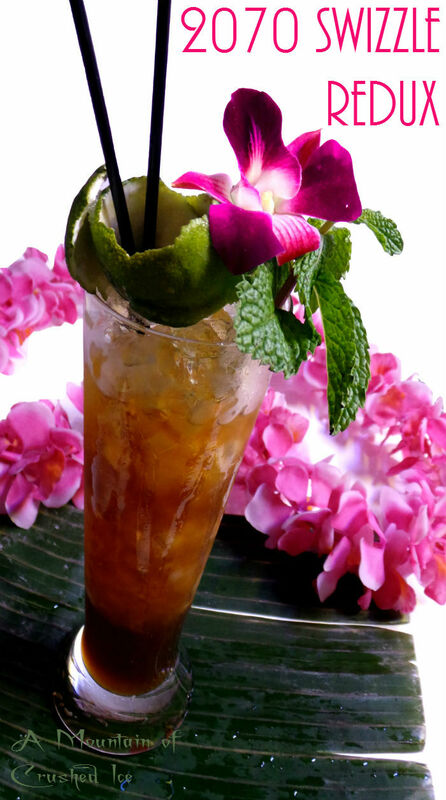 The Jet Pilot is a strong, spicy, rummy and intense drink which dates back to the Mai-Kai’s original 1956 menu and is based on Don the Beachcomber’s Test Pilot cirka 1941. 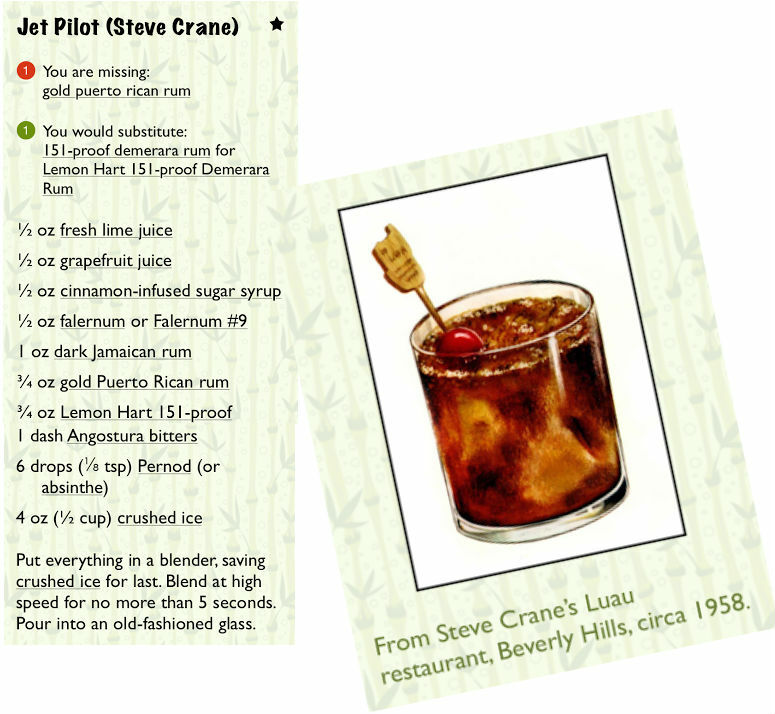 And Stephen Crane`s Jet Pilot from Jeff Berry`s “a must have…” – Total Tiki App! And like I did in my last post about the Fogcutter Challenge, i`m posting up a few of the pics that were submitted, and let me tell you I had a lot of fun with this! 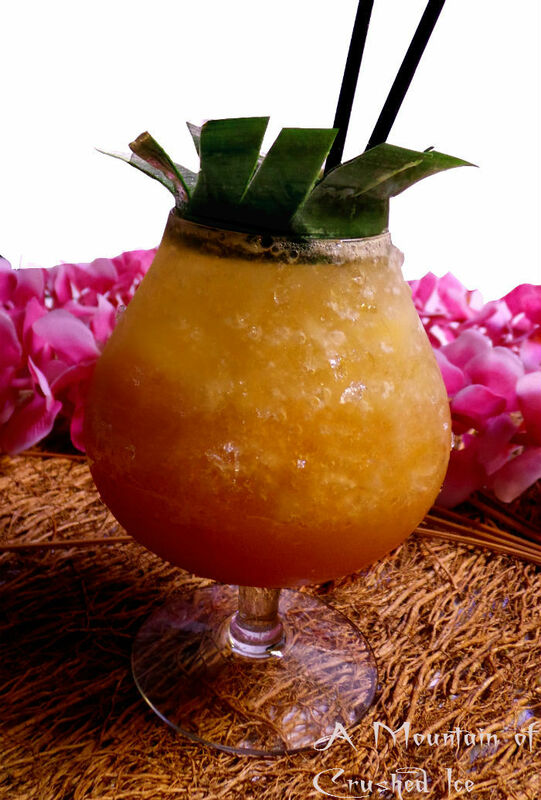 not only do you get to imbibe some superlicious tiki drinks, you also learn something about each drink since you (hopefully) make a couple of different ones and so by doing that you try different rum combos and recipe tweaks and learn a lot about how flavors comes together. 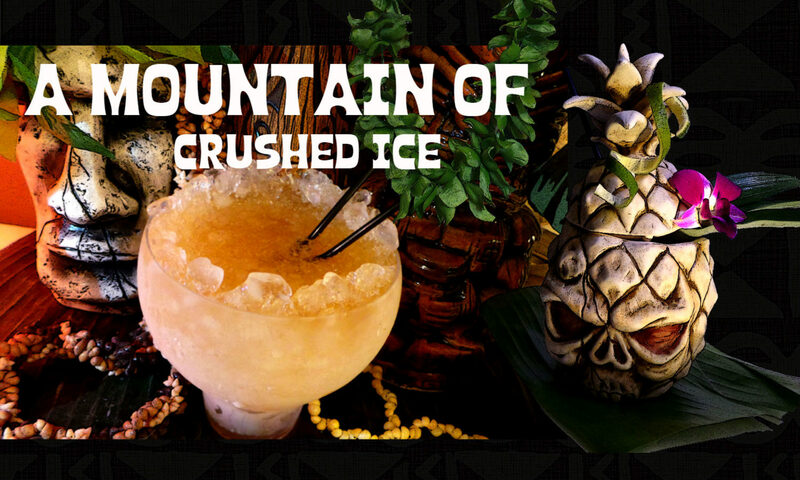 It takes a lot of practise to get the tiki drinks right and things like this, different tiki drink challenges inspires you too experiment and learn….it`s fun and educational. 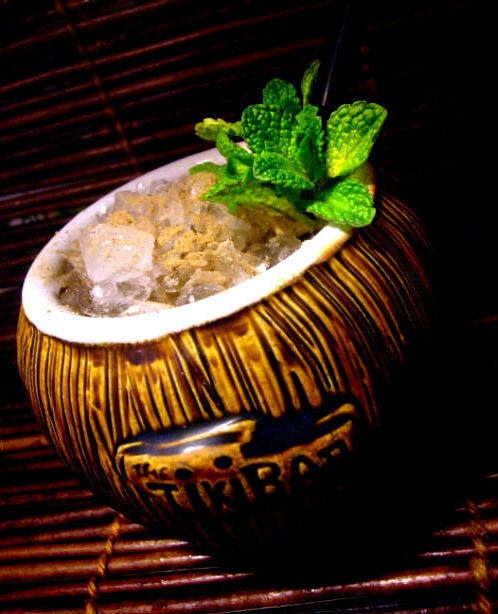 Also by looking at pictures and reading recipes of tiki drinks you learn something about what a tiki drink is and how it looks like, that for example, it´s not about adding as many ingredients as possible in a big mess where all the various flavors clash with each other or melt together into an undefined mess instead of being harmoniously layered…..
Tiki drinks are tropical and the roots of tiki drinks are in the Caribbean….that`s where most of the rums came from and some of the mixers, like the falernum and pimento dram, even though a lot of the tiki inspiration came from the South Seas. And the last one that came in…sent in from Mai Kai, what a beauty! 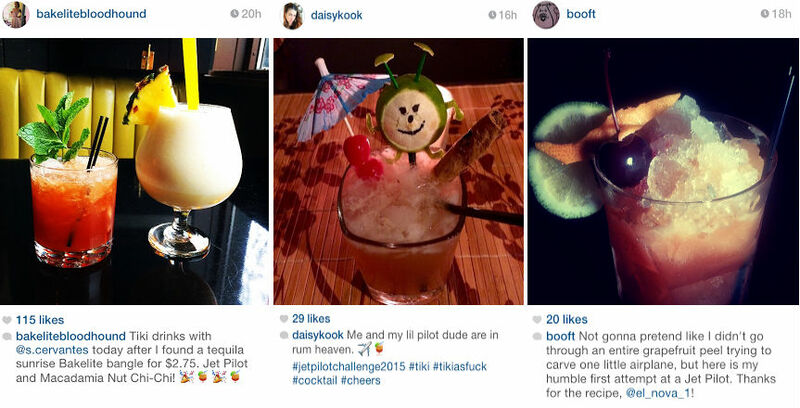 I just love how drink pics coming in from all over the places….Tacoma Cabana, Lost Lake, Ventiki, Bootlegger Lounge, Latitude 29, Tiki Ti, Frankie`s Tiki Oasis, Mai Kai…and all private homes and home tiki bars! And here are my three versions, they are all made from the same recipe the Stephen Crane version but they just contain different rum combos starting out the Jet Pilot night with a double drink in a huge goblet because I was thirsty…. Lost Pilot – made with Lost Spirits 151 Cuban Inspired and Polynesian Rums and Rum Nation Jamaica 8 year plus Wood`s 100 for the demerara flavor. Both the Lost Spirits and Wood`s are strong rums while the Rum Nation Jamaica 8 mellows the strong flavors out and keep them balanced adding “sweetness” to the drink, but not sweetness as in sugar sweetness….more like making it nice. The next up were two drinks, yes both for me… 🙂 and I called them the Co-Pilots…they had slightly different rum combos in them. 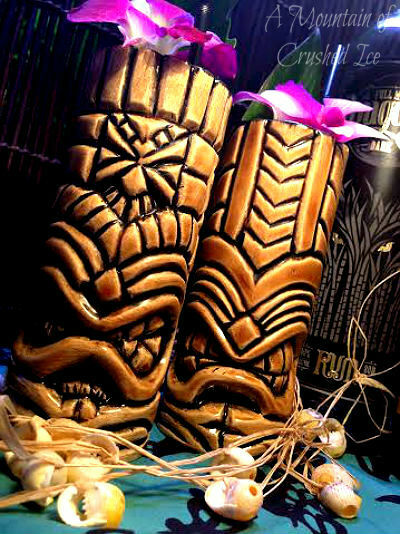 I decided to make two drinks (and yeah…after imbibing a strong double, don`t judge…) because I have these two ubercool pair (called The Royal Pair) of tiki mugs made by Wayne Hoareau, owner of Wild Thing Creations in Australia, maker of awesome tiki mugs and I wanted to feature this sweet pair together. One has Rum Nation 8 and Coruba overproof, touch of Wood`s 100 demerara and then Rhum Barbancourt and that rum combo was nice, kinda mellow and not as strong as the double and maybe that was a good thing? because…. – The next had a strong wicked rum combo full of flavors, mostly in the blackstrap route….yes I´m there again…It had Blackwell Jamaican Rum, Rougaroux Fullmoon dark, Wood`s 100 and Cruzan Blackstrap float – and a generous one, just poured…. 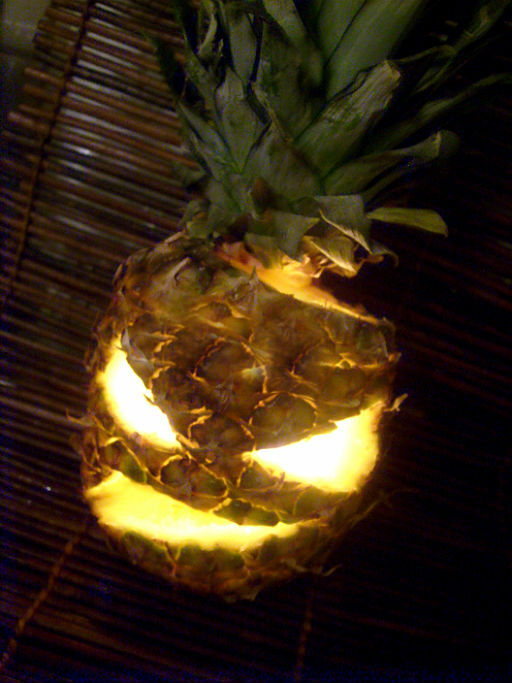 The last drink I made was….the PINEAPPLE Pilot!! flying pineapples all around!! with the cooolest pineapple Tiki mug on the planet!! made by Scott Taylor!! the pineapple was brimming full with Blackwell Rum, Lost Spirits 151 Cuban rum and Gunroom Navy Rum! 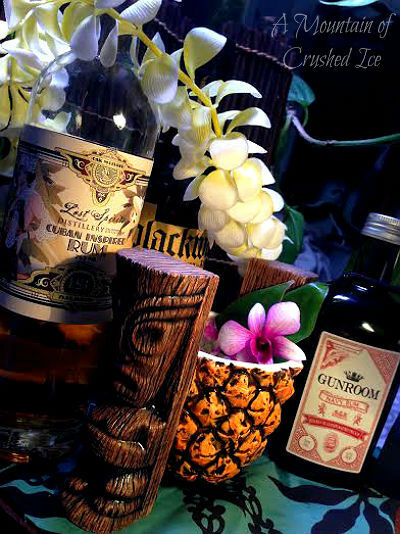 Tasty rum combo as well, the Blackwell rum and the GunRoom navy rum paired well together and the strength and slight fruity pineapple notes came from the ever so smooth but oh so deadly Lost Spirits 151 Cuban…. 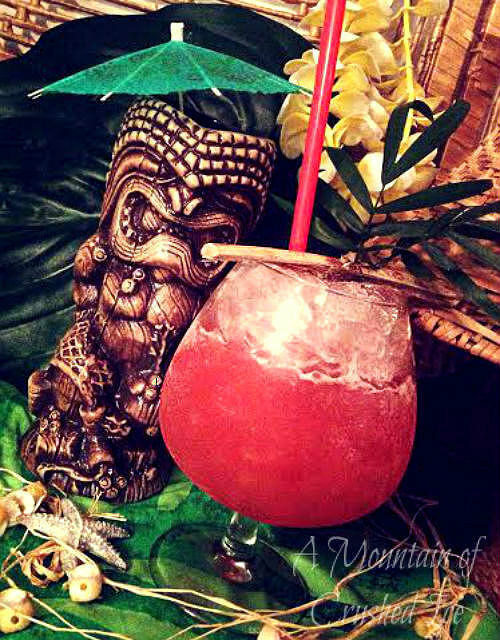 A book entirely devoted to one of my favorite tiki drinks – the Zombie!! Now the book does of course not contain only one Zombie recipe – it contains no less than 86 different recipes…..starting with my favorite the 1934 Zombie Punch – the original version. 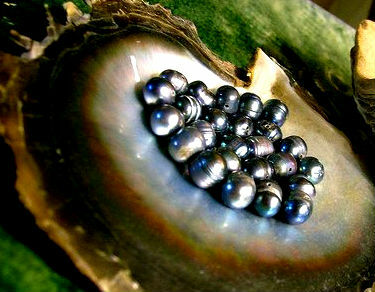 This was the one that started it all, as served at Don the Beachcomber’s famed Hollywood restaurant. This was the drink that made Don’s reputation and secured his place in cocktail history. 86 different Zombies? that could keep you busy and boozed out for a long time, especially seen to that the old saying “two at the most” was stated for a reason. This book could not have been written without Jeff’s extraordinary efforts at resurrecting Don the Beachcomber’s Zombie. 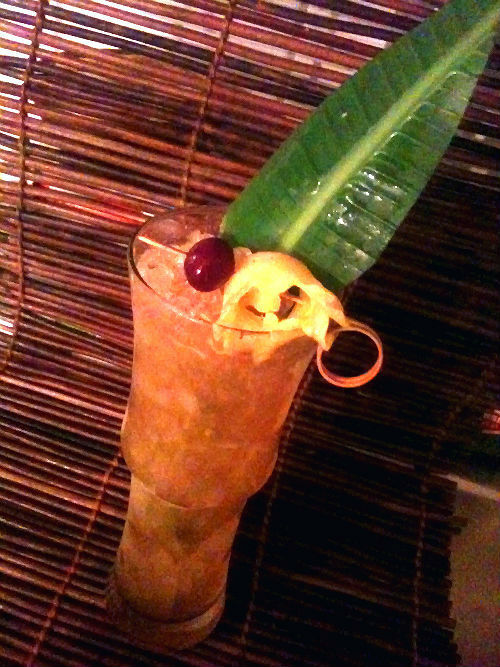 He truly is the Indiana Jones of Tiki Drink Archaeology. 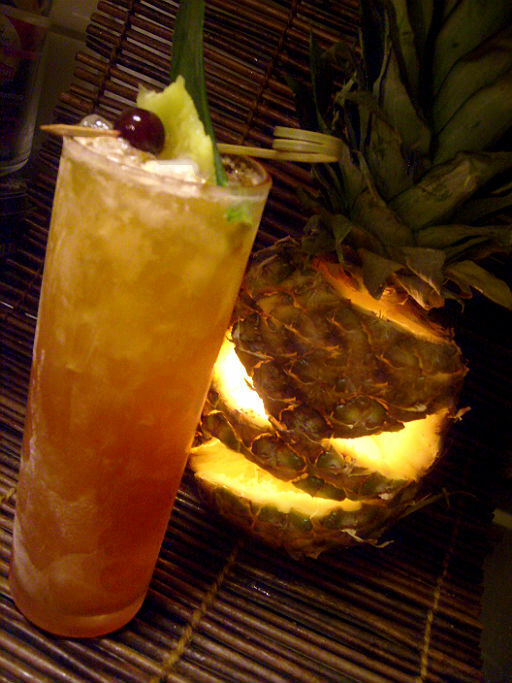 The book starts with a presentation of the Zombie which was the drink that launched a Tiki empire. Created in 1934 by a former bootlegger named Ernest Raymond Beaumont-Gantt – better known to the world as Don the Beachcomber – the Zombie was a revelation. 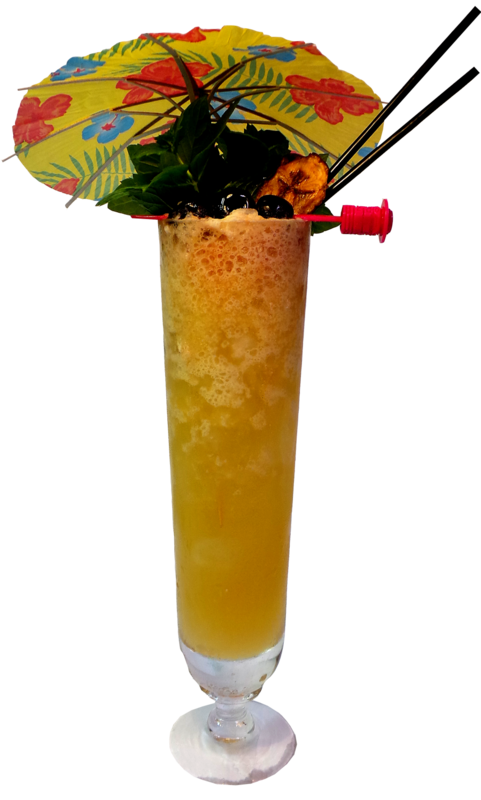 A potent mix of different rums, fruit juices, and exotic spices, the Zombie was to become Don’s signature drink and, eventually, a key part of his success and that of his namesake restaurant. 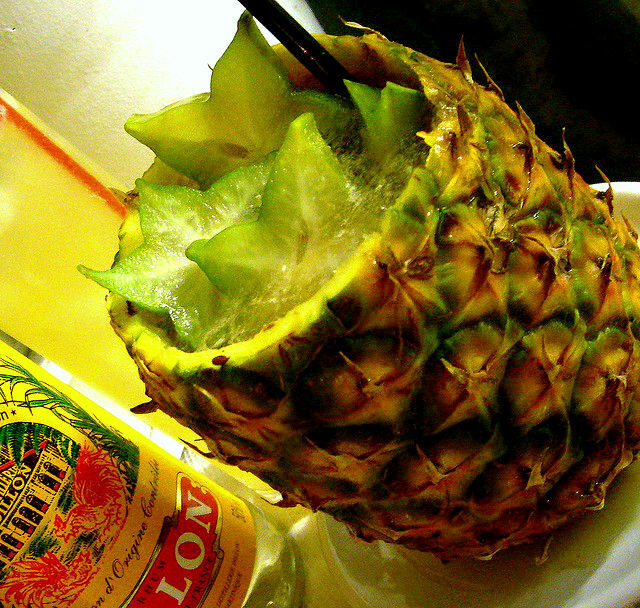 Don’s genius was found in rum and the varying ways in which it could be combined with other ingredients. 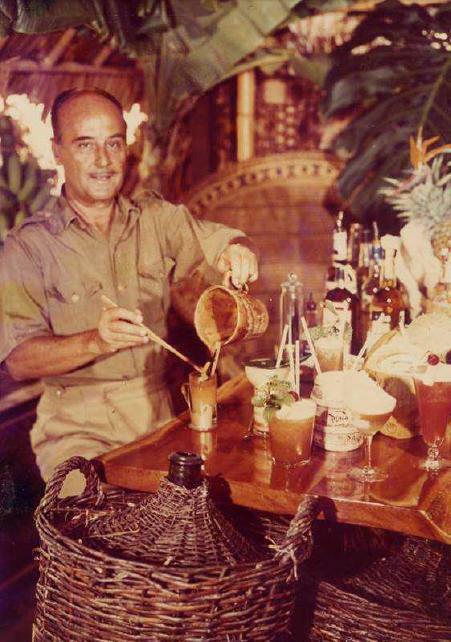 Not only was he the first bartender to invent Tiki drinks, he was among the first to use rum itself in a serious way. Out of all of Don’s creations, the Zombie reigned supreme. It was the drink that everyone wanted to try. The book goes on telling us how reportedly the Zombie was invented – whether true or not – and goes on to telling us about how many years later our beloved Beachbum (Jeff Berry) managed to crack the code for Don the Beachcomber’s original Zombie. And that`s why – thank you Jeff! 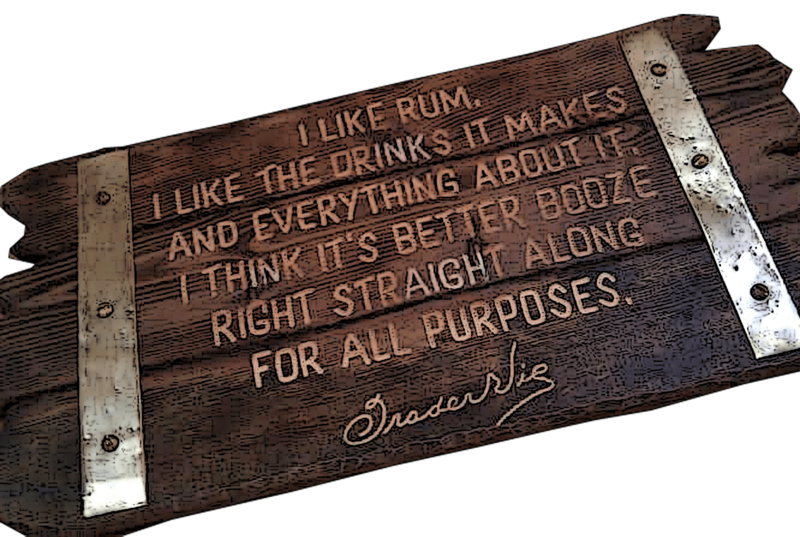 – i have been able with many others, to enjoy this drink from it´s original recipe albeit with different rums than was used at the time. After the introduction there´s a note about ingredients explaining what they are and where you can try to find them. The composition of the Zombie varied over the years depending on who was making it – but there are certain ingredients, however, that popped up most frequently and they are listed in the notes. And then – on to the recipes, all 86 Zombies! and it`s not just the recipes, there´s stories, anecdotes and pictures – all written in an entertaining style. In Zombie Horde, David J. Montgomery (aka Professor Cocktail) leads you on a journey through the history of the Zombie, starting with its humble beginnings in Hollywood, and following it as it evolved and spread over the decades. 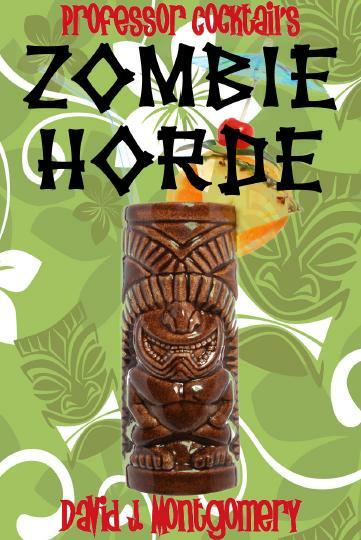 Zombie Horde includes recipes from notable bartenders like Trader Vic, David Embury, Salvatore Calabrese, and Dale DeGroff, as well as the formulas for the Zombies served at famous Tiki joints like the Tonga Room in San Francisco, Frankie’s Tiki Room in Las Vegas, and the Luau Room in San Diego. 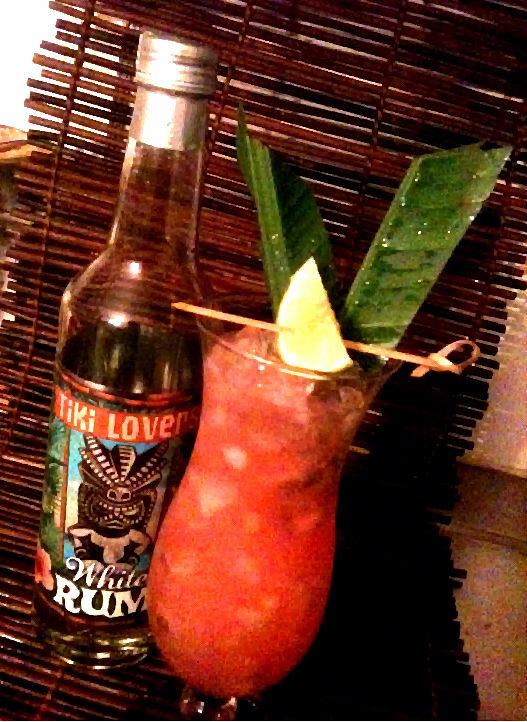 I`d recommend this book to anyone who`s interested in tiki drinks and of course – the Zombie. 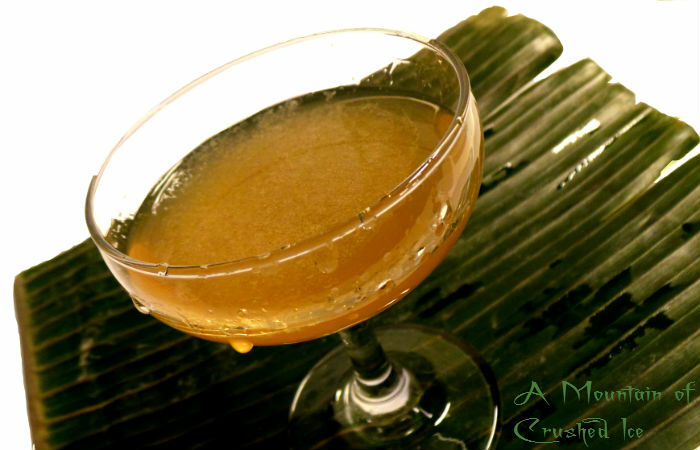 With such a gold mine of Zombie recipes from the 1934 original Zombie Punch to Bar Agricole’s Cap Haitien Zombie you just can`t go wrong. David J. Montgomery mixes his love of history and alcohol into one potent concoction through his work at ProfessorCocktail.com He is also a nationally renowned book critic and commentator on writing and the publishing industry. Mr. Montgomery is an emeritus columnist for the Chicago Sun-Times and The Daily Beast, and has written for USA Today, The Washington Post, Philadelphia Inquirer, and other fine publications. His short fiction has appeared both online and in print. A former Professor of History, he lives in the Washington, D.C. suburbs with his wife and two daughters. The ebook will be available exclusively through Amazon (as well as various international versions of Amazon), and costs just $2.99 to download. There are no plans for a print edition at this time, although it’s possible that could change. You don’t need a Kindle to read the book, though. You can also use the Kindle app that’s available for various platforms, including PC, Mac, various tablets (iPad, Android, etc. ), and smartphones (iPhone, Android, etc.). 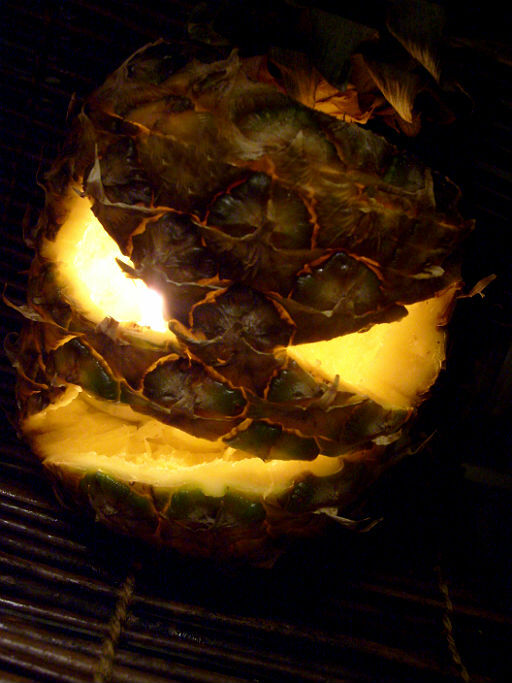 Obviously it has a lot of rum in it. So what’s not to like? Go get it! 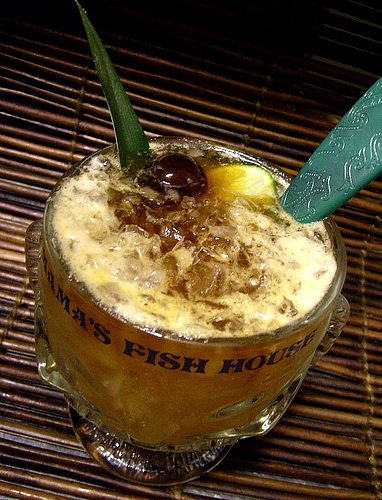 As served at the high-end Tiki and rum bar located in San Francisco, CA. Martin Cate’s Note: Simplified slightly and served on the stem, for the sophisticated savage. 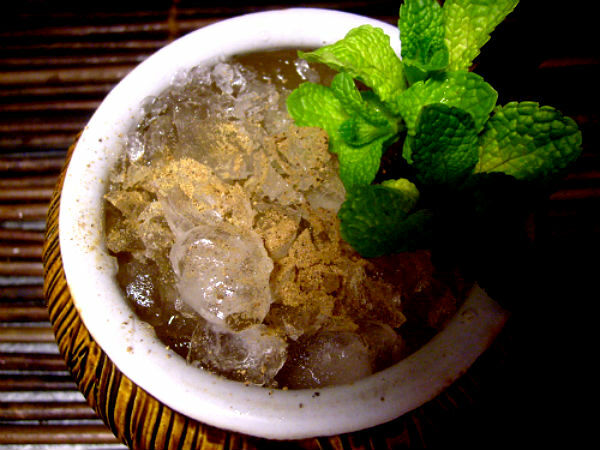 Shake and fine strain into a chilled cocktail glass that has been rinsed with absinthe blanc. Garnish with a lime and grapefruit twist that have been twisted together. And then i brought back my old Guyana Zombie which i made in 2009 for the TDN Zombie. 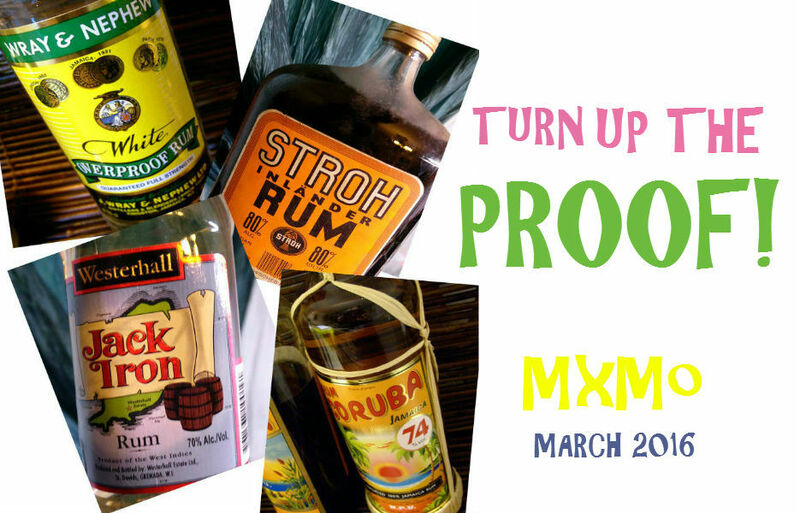 It doesn`t contain more than two rums but one is overproof to give the drink that kick it needs. It`s not an authentic Zombie, more a drink that is Zombie inspired. A decent float of 151 demerara. Serve in goblet with crushed ice. Sprinkle demerara sugar on top. Blend with crushed ice at high speed for 5 sek. Pour into goblet with more crushed ice. Garnish with sprinkled demerara sugar, lime wedge and brandied cherry. 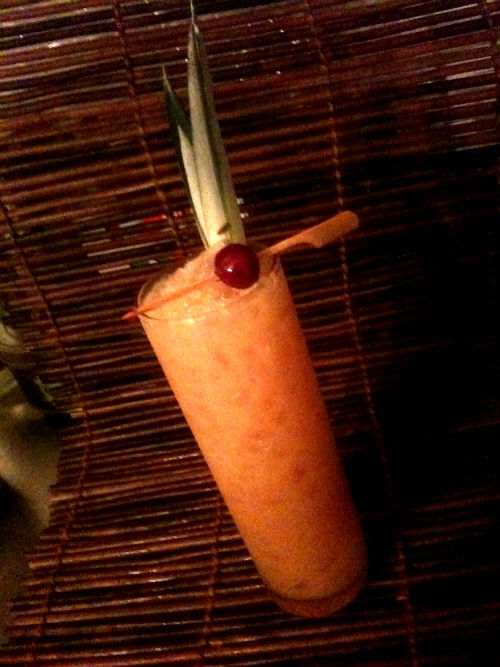 Third drink up for the Tiki Month hosted by the Pegu blog is a drink that was created by Martin Cate at Smuggler’s Cove – the nicely spicy 2070 Swizzle. I`m serving it in my third mug from the Fireworks studio in Glagow, the coconut mug. I could have made a drink that contains coconut and the best one that comes to mind i the Coconaut but i have already had it on here so i went and searched for something else and found the 2070 Swizzle. This swizzle contains Angostura 1919 and demerara rums, lime and honey, allspice dram, angostura bitters and what i believe is the secret to success . 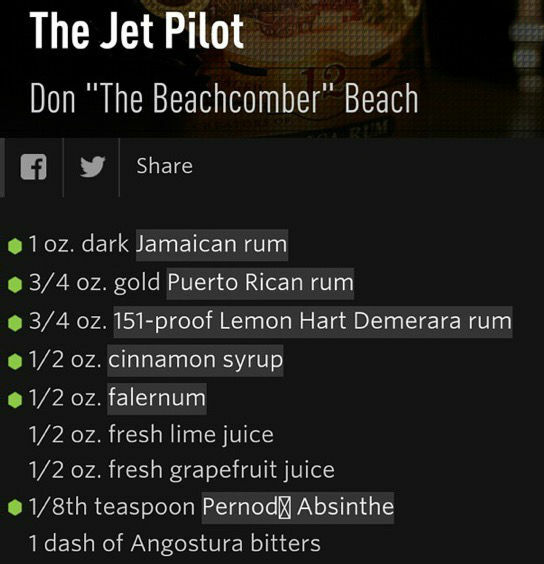 4 drops of pernod which is an ingredient that was extensively used by Don the Beachcomber and which in very small amounts ( 4-6 drops usually) adds a third dimension to the drink by adding contrast, i really like it. If you can`t find pernod you may use absinthe or herbsaint. The absinthe is less sweet than the other two which are not absinthes (pernod is a pastis and herbsaint is a brand name of anise-flavored liquor, originally made in New Orleans, Louisiana) – but since only only drops are used it doesn´t matter which one you use. Personally i used absinthe which are more to my liking in tiki drinks while i prefer herbsaint in say a sazerac. Swizzle and sprinkle nutmeg on top. Use about 1/2 cup crushed ice, flash blended for a few seconds. Lately I prefer to put everything in the blender but ice, set it to the lowest setting, on mine it is “Stir” and get all the ingredients mixed. Then I add the ice and hit it on high. I zap it for a second, let it stop and repeat. Do that maybe 3 or 4 times. Pour into the proper glass (collins/zombie, or the classic aluminum ones) and add ice to fill. Grate some fresh nutmeg on top. 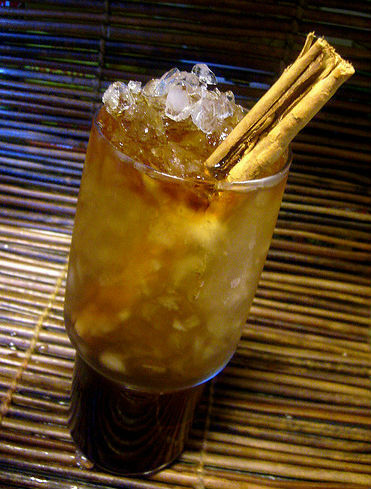 Add cinnamon stick as swizzle. If you use an aluminum glass, or even a collins, take a napkin and unfold it, then refold it longways. You should have a good frost on the glass. Lightly wet one corner of the napkin and press it to the glass so it freezes in place. Wrap around and do the same to the other end. This makes the drink easier to hold since it is so cold. And my blender has broken down so this one is swizzled the old fashioned way with a wooden swizzle stick. The 2070 Swizzle Redux tastes to me like a coffee spiced cousin to the first one with a little bit less demerara flavor and more of the Jamaican funk and (in my case) strong Caroni heaviness – and even though Caroni is a rum from Trinidad many of their strong rums does resemble Jamaican pot still rum. 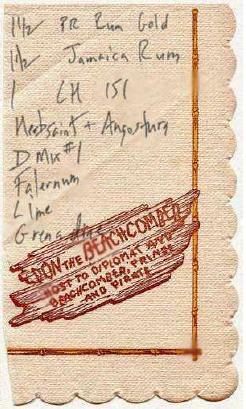 It´s a variety of the classic 1934 Don the Beachcomber’s Zombie with a blend of aged and overproof rums, plus rhum agricole and then cinnamon, grapefruit and lime..
I`ve had the zombie on here before but it´s a damn good drink! 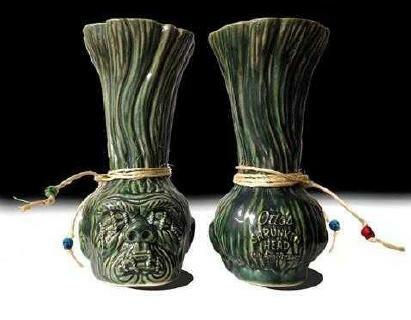 and if it wasn`t for one man namely “Jeff Beachbum Berry” we wouldn´t have this recioe today…he dug down the rabbithole of lost ingredients and recipes and un-earhted the original 1934 Zombie Punch. And that you can read all about in his book Sippin`Safari. But this time to make something different i have omitted the pernod and grenadine in this recipe and added grapefruit juice and then switched gold Puerto Rican rum for aged agricole. 0.5 oz Don´s Mix ( either use Trader Tiki aka BG Reynold´s excellent Don`s Mix or make your own by mixing 2 parts Grapefruit Juice with 1 part Cinnamon Syrup. Blend everything with 6 oz crushed ice, blend at high speed for 5 sek. Pour into a zombie glass (chimney glass) and add more crushed ice to fill if needed. 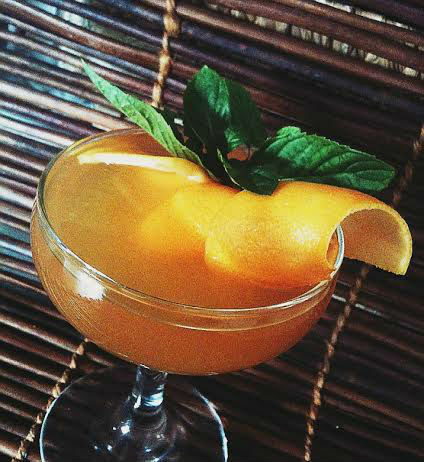 Top up with grapefruit juice and garnish with pineapple leaf and slice and cherry. 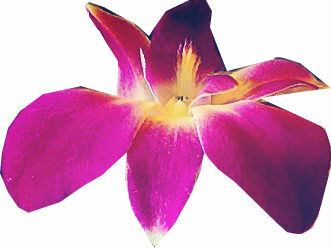 http://www.braindumps.com/C4090-456.htm http://www.test-king.com/exams/640-911.htm http://www.rrc.edu/ http://www.actualtests.com/exam-1z0-821.htm http://www.certkiller.com/exam-C_HANASUP_1.htm http://www.hp.com/.